A Community of Practice... a hui of thought leaders, practitioners, change agents, and advocates in cultural resource management and related fields. Our members come from a wide variety of sectors and first came together in June 2017. The initial gatherings helped to determine our collective values, express our interns, and to formally establish a community of practice that aims to mālama our wahi kūpuna. 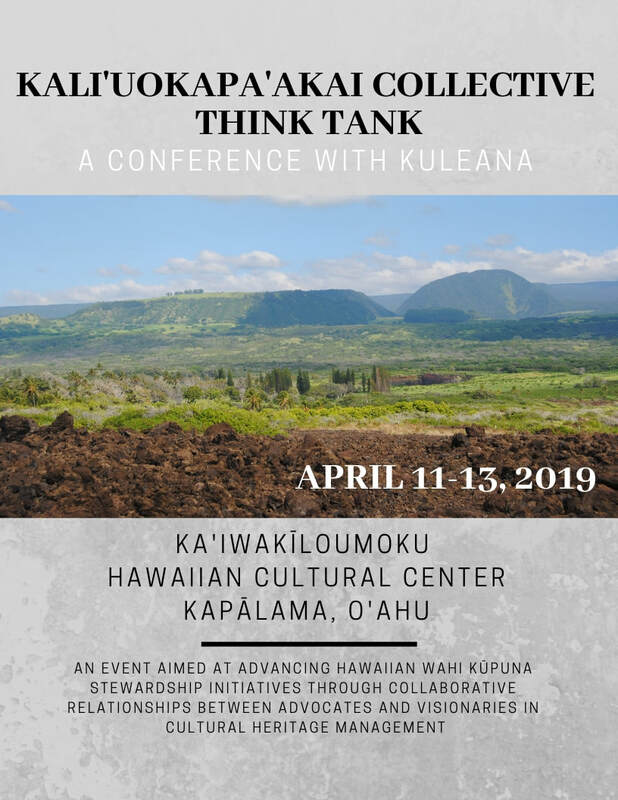 Strengthen wahi kūpuna stewardship through collaboration and collective efforts. Build capacity and increase collective action by helping to organize, manage and amplify - ideas, resources, and strategies from the Collective to safeguard our wahi kūpuna. Empowered communities with the capacity to restore, reinvigorate, and steward Hawaiʻi's (and their own) wahi kūpuna and ʻike kūpuna. Due to limited space this is an INVITATION ONLY event. Invitations are NON-TRANSFERABLE. Participants have been thoughtfully chosen by the Think Tank Design Hui to represent the different organizations and sectors doing work in wahi kūpuna stewardship. In addition to local participants from Hawaiʻi, there will also be an International Delegation made up of wahi kūpuna stewards from across Oceania. Although participant numbers are limited, the wider community of CRM professionals and policymakers will benefit from the outcomes which will be shared through a State of CRM report, and through future gatherings. A team-designed conference intending to create practical, accessible and concrete action items and related knowledge products to encourage innovation and positive change (versus only sharing information). The conference will include high-impact Ignite Talks and panel discussions focusing on pressing issues in wahi kupuna stewardship. Panels will bring together thought leaders to help illuminate challenges and focus participants' contributions. After each panel breakout group sessions will allow for participants to discuss challenges and potential strategies and bring their expertise to bear on the selected topics. The Think Tank is being called a “Conference with Kuleana” because participants, when and where appropriate to their own kuleana, are being asked to continue their participation with the Collective to produce the products and knowledge tools identified at the Think Tank. Organizers realize that we all have existing kuleana, and many of the invitees already carry significant kuleana. As such, the intention is to ask a wider group to collectively ʻauamo kuleana (carry/fulfill our responsibilities) specific to actions that are intended to create significant change in CRM that will ultimately increase respect for and capacity to care for our beloved wahi kūpuna.